This leaflet has been produced to give you general information about a Laparoscopic Roux-en-Y Gastric Bypass and the Single Loop Gastric Bypass. It is not intended to replace the discussion between you and your Clinician / Nurse or Dietitian, but may help clarify some of the issues discussed. If, after reading it you have any concerns or require further explanation, please discuss this with a member of the healthcare team caring for you. A Roux-en-Y Gastric Bypass is a surgical procedure which has two ways of helping you to lose weight and maintain weight loss. Firstly, the surgeon will permanently reduce the size of your stomach by stapling across and dividing the top of your stomach. This is known as a restrictive operation, which means it restricts the amount of food and drink which your smaller stomach and gastric pouch will be able to hold after surgery. Your stomach can usually hold up to 1500ml (approximately 3 pints) but this reduces to only 30ml (the size of a large egg). The second part of the operation involves attaching a shortened part of the small bowel to this small pouch through which the calories and vitamins are normally absorbed from food. Food requires enzymes to help with absorption. Around 1-1.5metres (3-4 feet) is missed out of the enzyme digestion circuit. This combination of restriction and reduced absorption makes this one of the most effective weight loss operations available. What is a Single Loop Gastric Bypass? Occasionally the small bowel cannot safely reach the stomach pouch to make a gastric bypass because a patient’s weight is too high. This might limit the only alternative operation to a “stomach-restriction” operation (sleeve gastrectomy). However a slightly different version of the gastric bypass might be an option for such heavier patients. 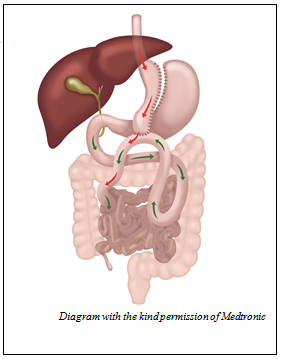 This involves making a longer, thinner stomach and gastric pouch, creating only one join with a loop (around 1.5metres) of the small bowel which is where digestive juices (green arrows) mix with the food (red arrows). This is only suitable for certain patients and your surgeon will discuss with you whether this is an option you might want to consider. Most of the time both of these types of gastric bypass are completed with laparoscopic “keyhole” surgery where several small cuts (1cm or less) are made to place hollow tube “ports” into the cavity of the abdomen through which long thin instruments and a camera are passed to allow the surgeon access to your organs. The abdomen is temporarily inflated with a gas (carbon dioxide) to create the space in which the surgeon works. It is necessary for you to have a general anaesthetic (be asleep) whilst your abdomen is distended by this gas and at the end of the operation the gas is released, the wounds are sutured and you are woken up. A 2 week pre-operative liver shrinkage diet is essential to allow keyhole surgery to be performed safely and successfully this will be discussed with you at the pre assessment appointment and a diet planning sheet provided. 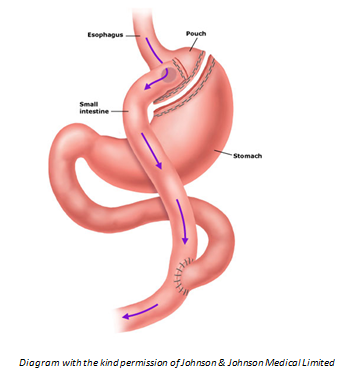 Occasionally internal scar tissue, a large heavy liver or other problems prevent the surgeon performing the gastric bypass through keyhole surgery. This may require a larger incision (“conversion to open”), a change of operation or abandoning surgery altogether for safety reasons. Any weight loss surgery can fail to help you lose weight if vital lifestyle changes are not made before and after surgery. If these lifestyle changes are not continued, you may regain weight. Only you can make these changes and this is why we prepare you for surgery over at least 6 months to ensure you are making the correct changes in diet and exercise to ensure it will succeed. If we feel that you are not capable of making these changes (which is hard work) then you may not be offered surgery. There are always risks of complications associated with surgery. Overall, less than 1 in 20 patients experience a serious complication. Risks are increased by heavier weight (higher Body Mass Index (BMI)) and medical conditions associated with weight gain. All of the common and several of the not so common complications have been listed. The list is not exhaustive. If you have any of these after your operation, you may require an emergency re-operation in order to correct the problem or a more prolonged stay and treatment in hospital. This diet is very important as it will help to reduce the size of your liver prior to your operation and this will allow your surgeon the room they need to operate on you successfully. When you have had your surgery you may spend some time within the recovery area of the operating department. They make sure you are not in pain and awake enough to be transferred to the Critical Care Unit where nursing staff can monitor you carefully, usually for your first night after surgery. You will have your blood pressure and other vital measurements taken regularly throughout the night. When you need to use the toilet the nurse will help you get up to go if necessary. It is important to start moving and walking as soon as possible after your operation, to reduce the chance of blood clot or chest infection problems developing. You will be wearing compression stockings and/or mechanical compression boots to encourage circulation after surgery. Please make sure your friends and relatives are aware you will not be on the ward for your first night after surgery and that it is normal to spend your first night after surgery on the Critical Care Unit. You will be transferred to the ward and stay a further 1-2 days until you have a completed a normal swallow test and started your diet plan. Shortly after your operation, on the first or second day usually, you will have a contrast swallow test which is an X-ray test where you will be asked to swallow some colourless liquid (“contrast”), which then passes through your stomach and bowel and can be seen on X-ray. It will show the doctors if there are any leaks or blockages. Once this is confirmed to be normal you will then be able to start drinking and eventually start your diet plan. Until this test is completed you will often have an IV fluids (drip), to make sure you have enough fluid in your body and therefore do not get dehydrated. You will not have anything to eat or drink until after your X-ray swallow test and during this time you will receive fluids to hydrate you through a drip. You may get a very dry mouth. The nurses will offer you mouth washes and you will be able to gargle as long as you do not swallow anything. When the results of your swallow test are known, you will be able to start drinking, very slowly at first. At meal times you will also be able to start to eat a soft diet. You will not be discharged until you are managing to eat and drink successfully. The Specialist dietician may have already discussed the post-operative diet with you in detail and provided you with a written diet plan for the weeks after surgery. Alternatively, they may see you on the ward. Your diet will gradually build up to more solid food. You must avoid drinking fluids at the same time as food to avoid vomiting and dumping syndrome (see below). If you are unsure about your diet or fluids, ask to speak to the dietician before you are discharged from the ward, or ring up for advice if you are in-between outpatient appointments. Do not struggle on unnecessarily; our specialist dietician/nurse will always be happy to advise you. This is an unpleasant set of symptoms including feeling sick, weak, faint, sweaty and diarrhoea. It is where the food in your stomach is either too liquid and sugary or too quickly washed into the small intestine through the join. This is why it is vital to avoid sweets, sugary drinks and to drink liquids 1 hour before or after a meal. Please note: ensure you leave a gap of 2 hours between taking the Vitamin D and Calcium tablet combined tablet and the A-Z multivitamin. At your first follow up clinic at 6 weeks your surgeon or specialist nurse may recommend that your GP commences Vitamin B12 injections every 3 months as your absorption of this vitamin is affected by weight loss surgery. Ensure that you wear your compression stockings for 2 weeks after your surgery. You can shower but not bathe for 1 week after your surgery. Ensure that you keep your dressings clean and dry for 5 days and then remove the dressings. Most wounds are closed with absorbable stiches. If you have any bleeding, redness, swelling or excessive pain please contact the discharging ward, bariatric specialist nurse or your GP. Your drain site may ooze for a couple of days after discharge but this should stop within 2 to 3 days and spare dressings will be provided by the ward should they be required. Ensure that you have requested a fit note from the ward doctor if you require one. You should expect to return to work after 2 to 4 weeks. You will have regular blood tests at intervals over the 2 year follow up period and occasionally additional supplements will be needed. Ensure that you have your dietetic post-operative diet sheets before you are discharged. Check your car insurance policy before driving. You can usually drive when you can safely perform an emergency stop and turn to look at your blind spot usually after 1 to 2 weeks, providing that you are not taking any medication that may affect your ability to drive. Do not do any abdominal/heavy exercises for at least 6 weeks post-operative. You may resume intimate activities when you are ready. If you become constipated, please ensure that you are drinking at least two litres of water in total over the course of a day in between your meals. Before your surgery you will be given advice from your bariatric surgeon, dietitian and bariatric specialist nurse. You will be asked to attend a local bariatric support group, the venue of this group will depend on where you live and will be made clear to you at your first appointment. We consider the visits to the group to be essential for all patients, as this will allow you to talk to other patients at all stages of the surgical process and then help you make an informed decision about your surgical choices. If you have any illnesses which the surgeon feels require treatment prior to you having surgery, this will be organised and will help to minimise your risks of complications when having the Roux-en-Y Gastric Bypass operation. Should you require further advice on the issues contained in this leaflet, please do not hesitate to contact the Bariatric Department on telephone number (01482) 624309. 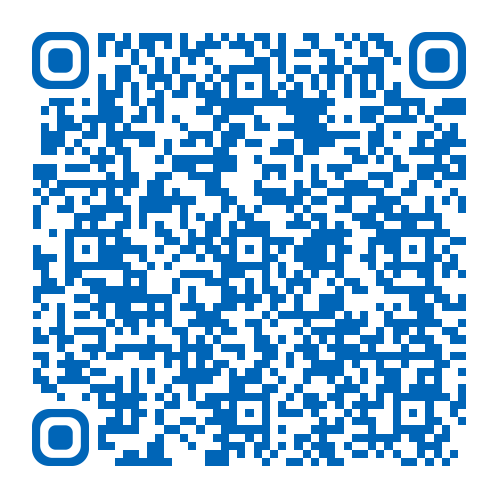 For Dietetic advice, contact on telephone numbers (01482) 674133 or 875875, ext. 3168.